We last caught up with Lost and Grounded around a year and a half ago, when it was a relative newcomer to the already booming Bristol brewing scene, and were suitably impressed by its combination of respect for continental brewing traditions and its application of science. We were particularly intrigued by its decision to make a Kellerbier – an unfiltered, hazy pilsner – its signature brew, and described it as “the heartfelt, liquid embodiment of the company’s founding principles,” while also observing hitching one’s wagon to a lager might also be “commercial suicide”. With the benefit of hindsight, Alex and partner Annie Clements – the creative force behind Lost and Grounded – couldn’t have timed the launch of Keller Pils better, and the brewery has been at the forefront of the craft lager wave that has gained momentum over the past year. And Alex knows whereof he speaks. His career began in the shadow of Molson-Coor’s mega-brewery in Golden, Colorado, where he studied chemical engineering, destined for a career in oil and gas. Every Friday afternoon, he and his fellow students would take what they called the “short tour” sneaking up the back stairs to mingle with a tour group as they went into the bar, and pick up a free beer. From there, he moved onto homebrew experiments with the traditional American and English pale ales that he saw springing up among Denver’s crop of now world-famous craft breweries and began to ponder how he might turn his passion into a career. It took several years of fruitlessly approaching breweries and a move back to his childhood home of Australia before Alex got his big break with Aussie craft beer upstarts, Little Creatures. He cut his teeth there for eight years, learning as the brewery’s output increased ten-fold to 10 million litres per year. By the time Alex moved with Annie to London in 2013, to take the head brewer job at Camden, he knew the German-built Krones Steinbecker kit inside out (the same kit that is now the gleaming heart of Lost and Grounded) and understood the demands of large-scale brewing. So when Annie dreamed up the concept for their own brewery in early 2015, they had all the experience they needed to get the formula right first time. It’s this partnership between Alex and Annie that remains at the core of Lost and Grounded; Alex’s technical expertise has ensured a steady flow of consistently stellar beers, while Annie’s creative vision has built a memorable brand, and pushed the brewery’s ever-expanding team to keep innovating and forging ahead with new and interesting beers and events. Collaborations are a big part of Lost and Grounded’s calendar these days, and brewers from all over the UK and beyond seem keen to work with the brewery (perhaps another perk of having spotted the lager trend before it broke). The brewery now has regular events in its taproom, particularly during the summer, where guest brewers will arrive to make a beer on the Friday, before a big party with guest taps on the Saturday. 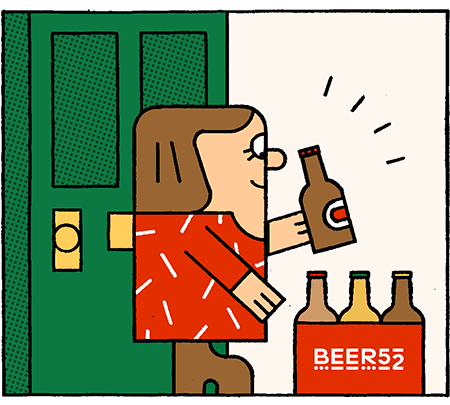 This month’s Beer52 box features one such exciting collaboration with Moor Beer (exclusive to members): a smoked ale, which uses classical European hopping to put the intricate smoked malt character front and centre. 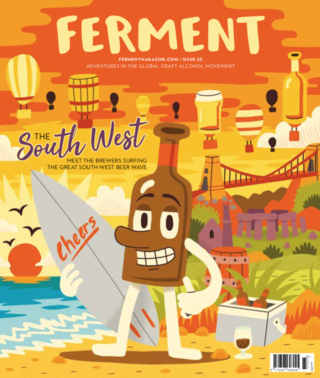 The collaboration parties, which have become a popular feature of the Bristol craft scene, are a great example of how the city embraces new breweries, and what an exciting, positive atmosphere prevails here. “The scene is definitely still evolving,” says Alex. “We were a newcomer, but there have a been a few more since we got started. Bristol has a good feel about it; there’s a lot of good independent food and drink and a good community within that food and brewing scene. We’re doing what we do, and everyone else has their own thing too. The general attitude is ‘how can we work together to make this even more awesome’. That’s the reason we made the brewery in Bristol - we’re not from here, so we chose it over everywhere else.